It seems that these days, everyone is focused on how to be more eco-friendly – that means “reduce, reuse, and recycle.” When folks hear this phrase, they tend to think of recycling soda cans and turning off the lights when leaving a room. 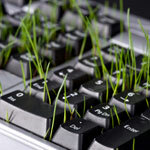 But there are other ways to take “greening-up” your environment to the next level. Reduce your dependence on disposable items. Returning to products that can be reused, like refillable pens and tape dispensers, will go a long way toward reducing what ends up in a landfill. Resist the urge to choose price over quality. You can save more money by buying durable products that are made to last, even if they cost a few pennies more up-front. 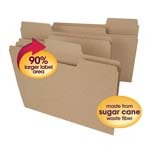 For example, cheap file folders that fall apart after a few months’ use and have to be replaced not only create more trash, but also cost you more in repeat purchases. 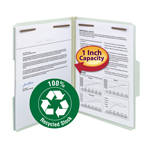 Choosing brand name, quality office supplies will save you money over the long-term. 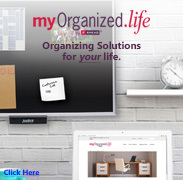 Are you tossing out paper that still has life left in it? Let your paper do double duty! Pages with printing on only one side can be flipped over and run through the printer again for rough drafts. 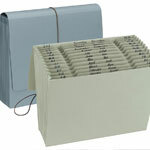 Mailing envelopes are great for making lists or taking messages. 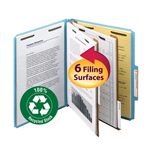 File folders can be relabeled or turned inside out and used again. The manufacture of office supplies is highly resource-intensive. 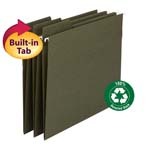 But recycled products only require half the pulpwood of non-recycled products. By recycling your used paper, you are contributing to the eco-friendly manufacturing of new office supplies made from recycled material. 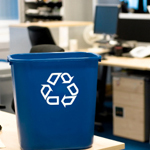 And there really is no excuse not to buy products made from recycled material, now that office supply companies like Smead offer more “eco-friendly” versions of every product imaginable. It doesn’t take much extra effort to go “green,” and even the smallest contribution will make a big difference to the environment!